Be happy because it is what you desire, and you are deserving of it. 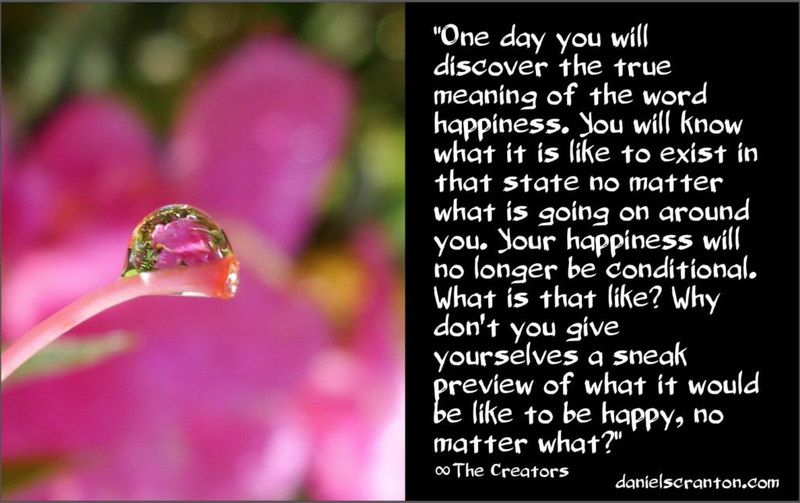 “One day you will discover the true meaning of the word happiness. You will know what it is like to exist in that state no matter what is going on around you. Your happiness will no longer be conditional. What is that like? Why don’t you give yourselves a sneak preview of what it would be like to be happy, no matter what? You understand that these states of being are all around you, existing as vibrational frequencies. And that in order to access it, you must simply make an intention to go to that place, to that frequency, and to let yourselves be guided to it. It is not something you can achieve with your minds and your thought processes. It is something you must allow yourselves to drift into.